Just happened to be perusing the latest edition of Waxpoetics magazine (the Hip Hop issue) the other day when who do I see on page 70 but none other than Phill “Soulman” Stroman! 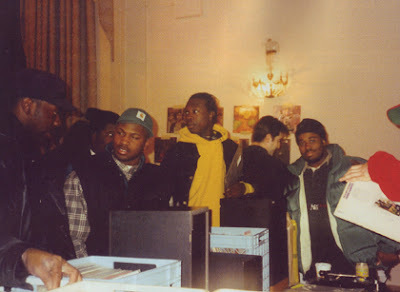 World famous hip hop journalist Chairman Mao caught me in a candid moment at one of the Roosevelt Hotel record conventions back in the 90’s- that’s me at the far left choppin’ it up with Tyrone (aka Fusion Unlimited). And that’s Baby Paul of Beatminerz‘ fame at the far right rockin’ the black hat BTW. I truly regret not doing more picture taking myself back when I was a record show regular… SO much lost history, as one may be able to surmise by looking at some of the other pics in Mao’s article. I’m gonna go out and buy 50 copies! HAPPY NEW YEAR, my people. This entry was posted in misc, news, soulman. Bookmark the permalink. hey phil can you tell me a little about john carraro and sang woo?forgive my littleness. I saw a bunch of pics in the mag but nothing about them in the article. Yeahhhh. Soulman. In a picture.Captured in a golden cage!